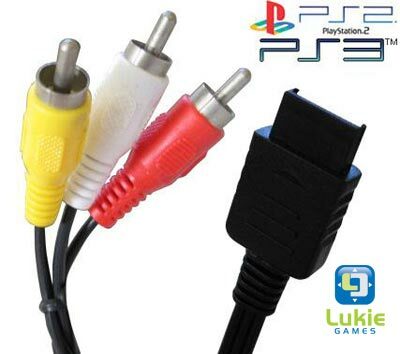 Replace that broken Playstation 2 cable with this new Playstation standard AV Cable! 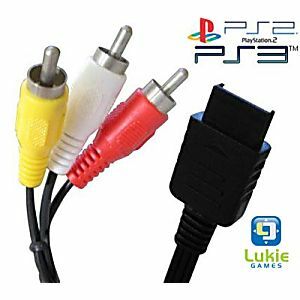 The Playstation Standard AV Cable provides the same picture quality as the AV cable included with your Playstation system. Just what I needed, no issues at all! Needed to replace my old RF cable. This one works great. It nice to be able to play my PS2 again. I’m so happy to be able to actually play my PS2 again! Thanks Luke Games! I have found a new place to purchase items for old gaming consoles! Can’t beat the price either!!! It works FANTASTIC!!!!!!!!!!! i can actually see the games im playing now ...and there is no snow!!!! This is EXACTLY what I needed. No need for some ridiculous fancy universal AV cable in my house. Works perfectly! Brought it online and I couldn't be more thrilled with the purchase. It was just what I needed to get my system up and running again. I accidently broke my cable & needed a new one. I found it so cheap & quickly it was amazing. I swear lukie games have any & everything you need & at a very fair price ! Cable works just fine, arrived on time for the weekend. Kept my kids "invisible" for hours, brought life back into the old PS2. Tkanks Lukie.